Courtney proposed to Shannon in her parents' living room. She presented Shannon with pictures of her parents and grandparents on their wedding days, which she followed with a picture of Courtney and Shannon themselves and a card. She described the love her parents and grandparents possess for each other and told Shannon that she wishes the same for them before giving her two boxes, containing vintage rings, formerly belonging to her mother and her grandmother. Between the two sets of rings are close to 100 years of happiness and love and now Shannon and Courtney wear those rings and continue that beautiful tradition of love and family. 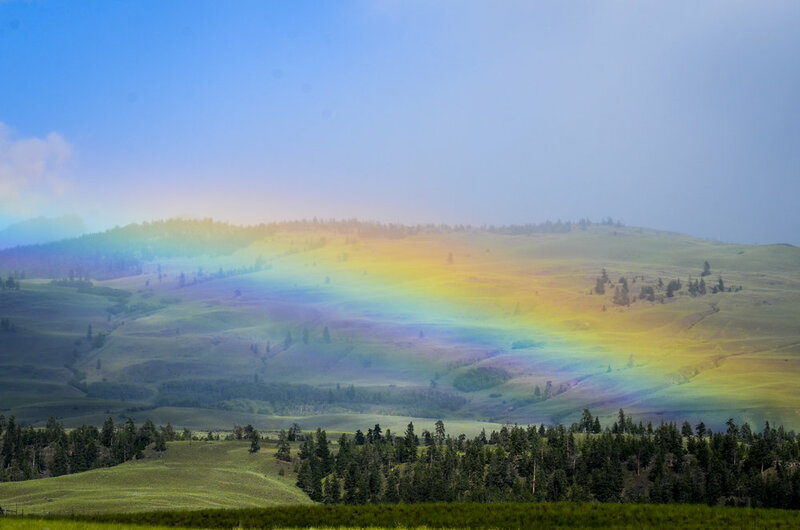 The couple tied the knot a year later on June 13, 2014 at the Minnekhada Lodge in Coquitlam, British Columbia. Built in 1934 and nestled at the top of a winding road, it was a perfect backdrop for their guests to enjoy their cozy and personal day. 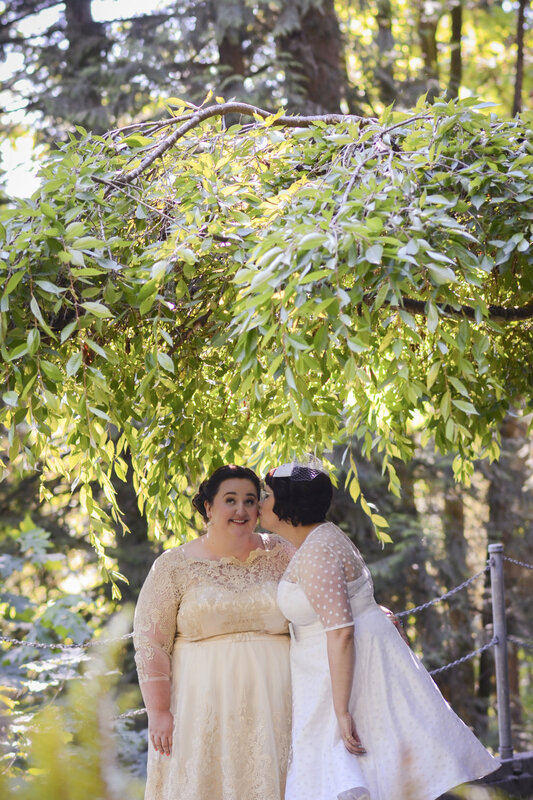 They felt confident that the lodge could accommodate their wedding after seeing examples of other queer weddings on the venue's website. "We wanted our guests to walk in and know instantly that this was not going to be like most weddings they had attended." Their ceremony was outside of the lodge, officiated by a friend, who read parts of a Wonder Woman comic book. Their bridesmaids and flower girls all wore pastel dresses in different colors and walked down the aisle holding books (rather than bouquets) to the Golden Girls' theme song, "Thank You for Being a Friend." 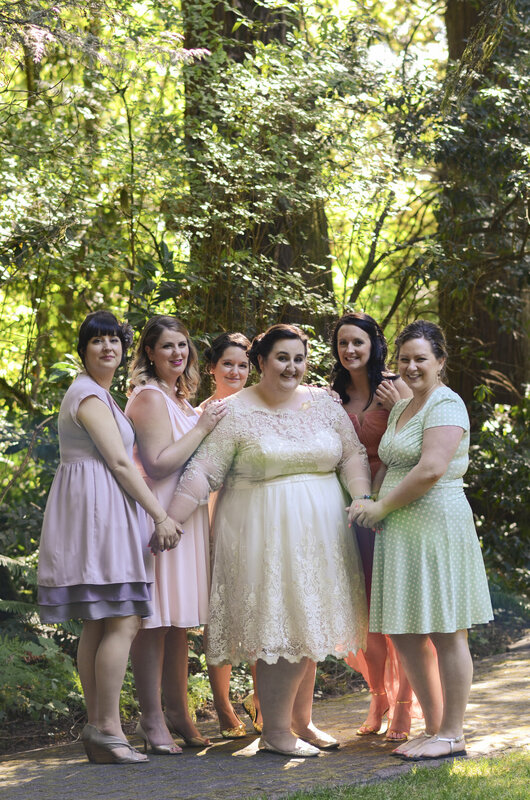 Shannon wore a gold tea length dress from ModCloth with coral heels, which she kicked off for their vows. Courtney's dress was a custom white, polka dot, tea length number by Pixie Pocket, which she matched with a pair of funky cat heels. They wanted to celebrate their love and the life they built together by using a touch of DIY and vintage. They found a local farm that sold wildflowers set them up throughout the venue in mason jars. 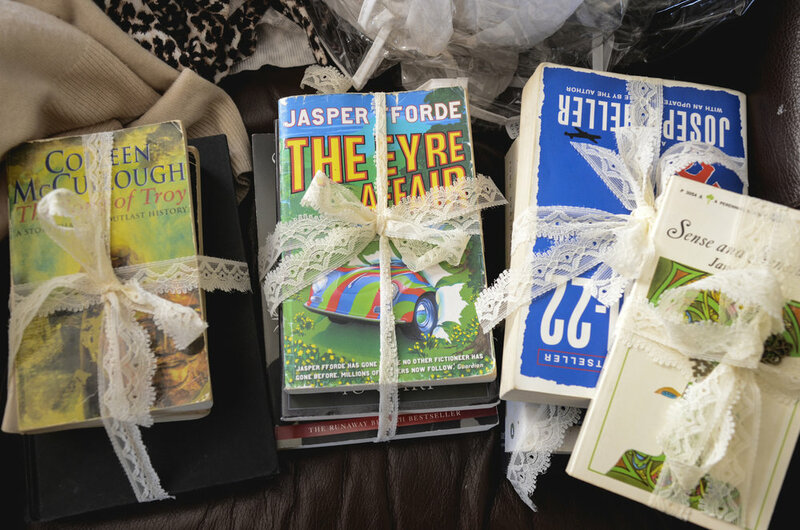 Their guests' name cards and table numbers were stamped onto vintage library book cards. "Our goal wasn't to wow our guests," they explained, but it's hard to believe that, after seeing how much work and detail they put into each display and decoration. 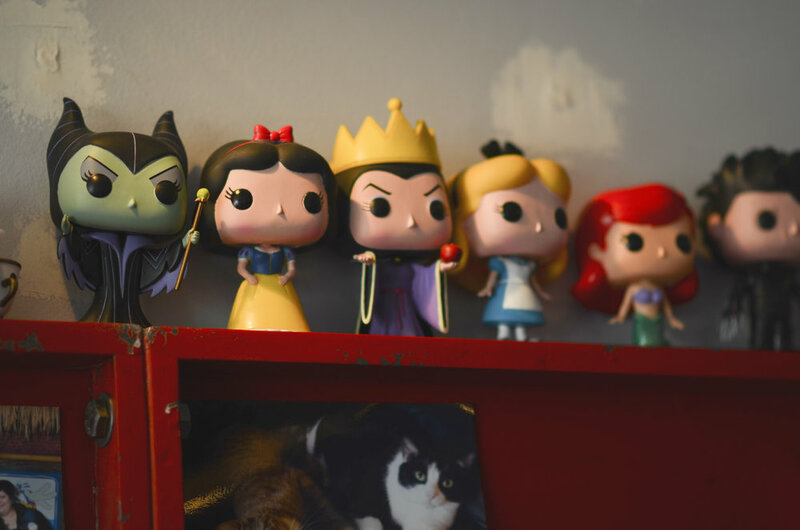 Shannon crafted most of their decor and they showcased bits of their interests and personality everywhere with books, pictures of their cats, and Star Wars collectibles, and other pop culture memorabilia. 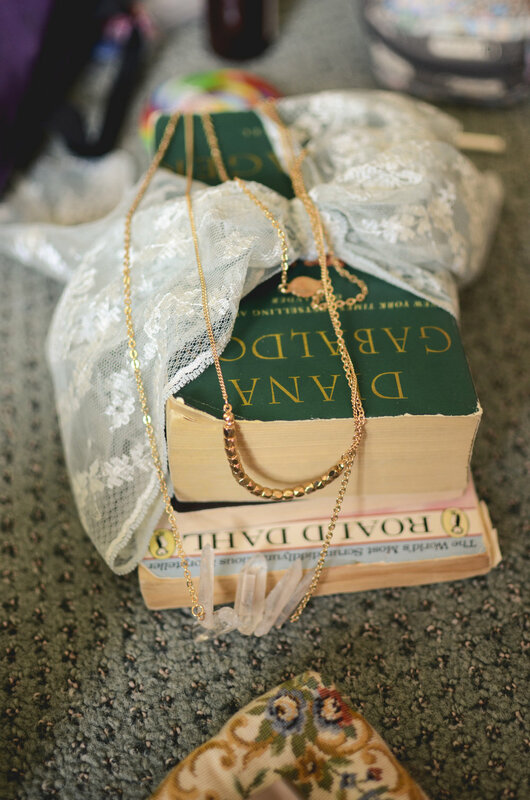 They were gifted many items from friends and family, which filled their venue with love and special connections to each of their guests. Upon entering the lodge for the reception, guests were greeted by a guestbook full of photos from the years Courtney and Shannon have been together. The dining tables were covered in vintage lace linens and mismatched dishes, with collections of candles, painted tea cups with peonies, mason jars of wildflowers, and small childhood toys as their centerpieces. There was not a spot in the room where you couldn't see the wonderful pieces of the puzzle that made them whole. Each chair was marked with a homemade rainbow sugar cookie and a handwritten quote beside each person's name. 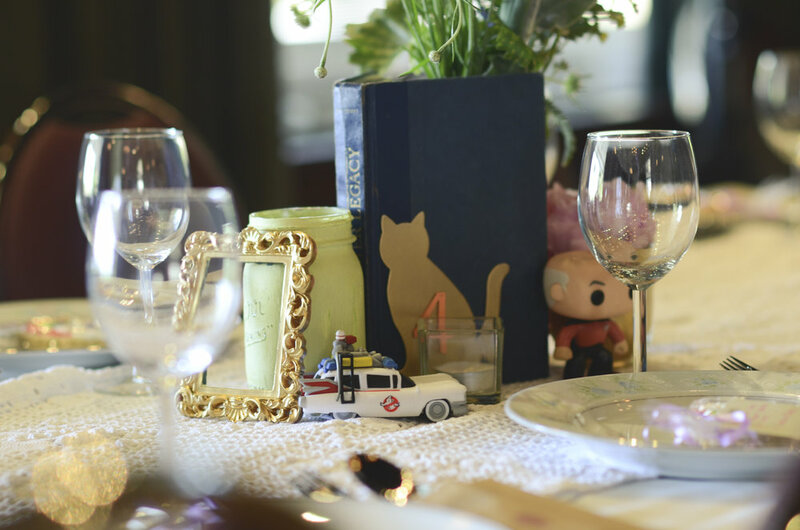 The couple sat at a head table adorned with piles of their favorite books, childhood photos, and scrabble letters spelling out "mutual weirdness." Shannon sewed hundreds of paper hearts together that hung from the ceiling on one side of the venue. There was no shortage of personal touches, but one of the most memorable moments of the day was when Shannon's brother sang during their first dance. The DJ played a lively mix of hip hop, 90s pop, and classic country hits and all they danced the night away. There were plentiful offerings of wine and beer, including a beer brewed by a friend called "Two Chicks Veil Ale." Their wedding cake was served with a selection of the most amazing pies, which were also gifted from a friend. 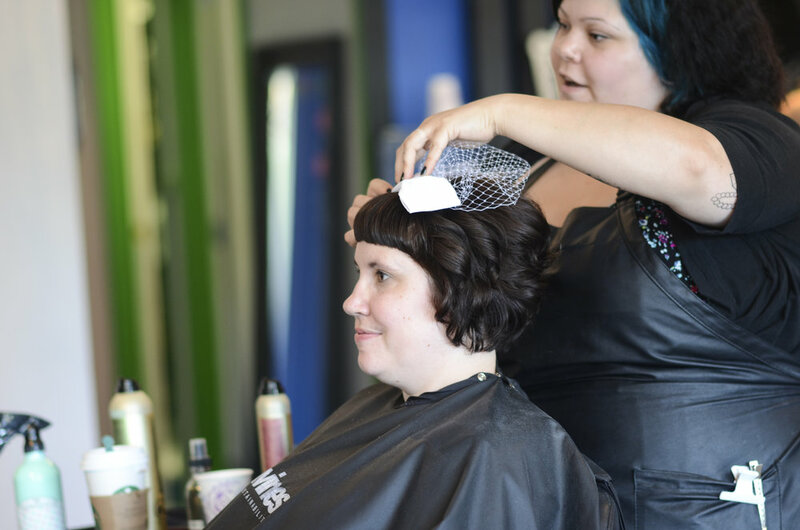 With a modest budget of $10,000, they relied on friends and family to assist in making their day perfect. Along with the gifted items and performances, they also had helping hands decorating. They did have a Day Of Coordinator, who was in charge of making sure the day moved along smoothly, but their friends were the true heroes, driving all of the supplies to the venue early before the wedding. With these moments, Courtney describes their day as "filled with love and joy and moments that made my heart feel like it would explode with gratitude and possibility." 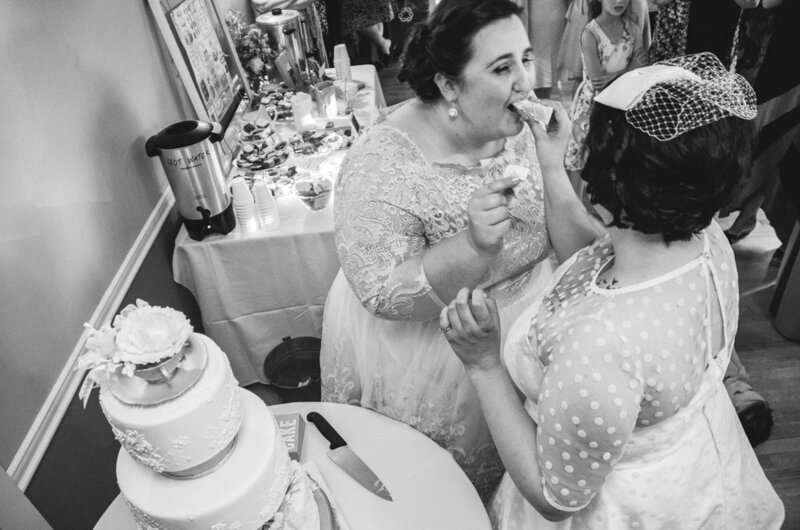 While working with a smaller budget was challenging, Courtney and Shannon rose to the occasion and poured their heart and soul in every nook and cranny. Their advice for brides-to-be would be to stay true to their visions, but be flexible. "Work hard to make sure that your wedding represents both of you," Courtney warns. "It can be easy when having so many tasks to get lost in the details. If there ever is a moment you feel lost, get back to the core of what this wedding day is all about: your love." 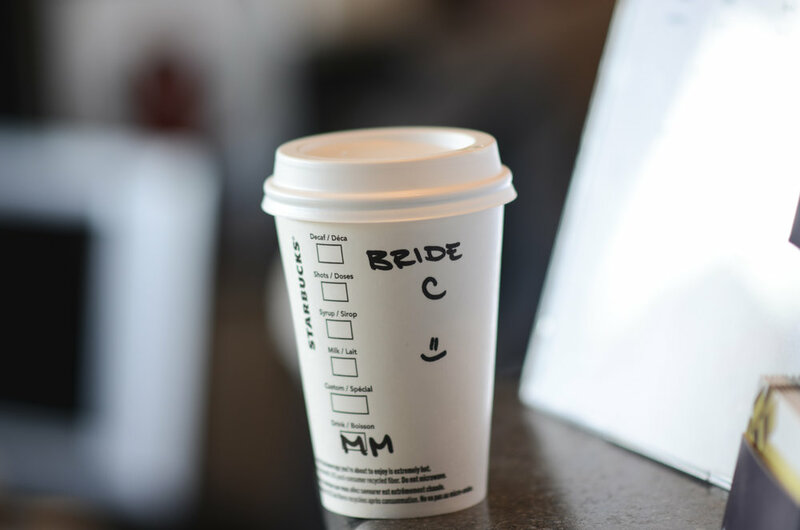 The brides made sure that each of their guests had a moment of the day just for them and it left everyone feeling that they had gotten to be a part of something truly special.